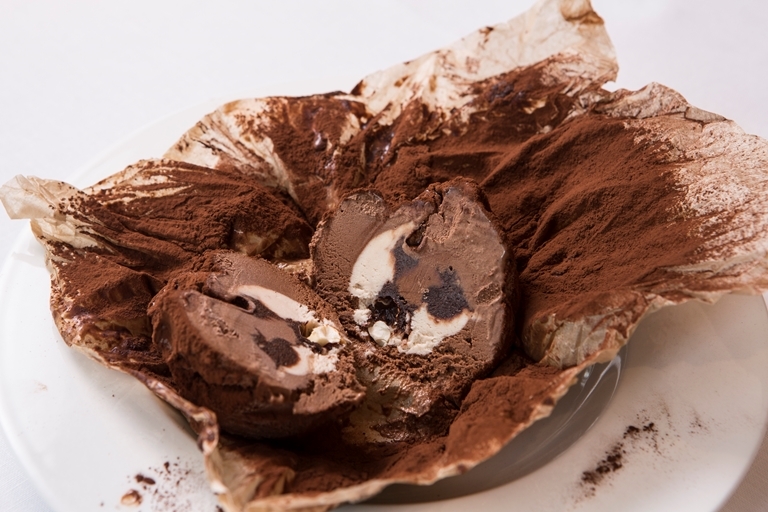 Originating from Pizzo in Calabria, this tartufo di Pizzo recipe is one of chef Francesco Mazzei's favourite dishes from the region. Unwrapping the paper exterior reveals a chocolate ice cream bombe with a hidden centre of hazelnut ice cream, sugared hazelnuts and thick chocolate sauce. The cocoa-dusted dome resembles a tartufo (black truffle), and was supposedly created in Pizzo in the 1950s to solve a dessert crisis at an important feast. While this dish requires several hours of chilling and freezing, all the elements can be made well in advance which makes this a perfect dinner party dessert.